U.S. Rep. Tim Walz got up early on Sunday, Aug. 19. He was heading to Iraq and wanted to finish packing for the trip. But those plans would soon be disrupted by news of the massive flooding in southeast Minnesota. Within hours, Walz was heading east toward flood-stricken areas, his trip to Iraq canceled. His first sight of the scope of the devastation came when he reached Rushford, a city of 1,700. There, he found a city underwater -- except for a small, dry bit of land. "It was pretty dramatic," Walz said. "There was a small island with one church, a part of the school and a city building that was dry, and 15 feet away there were probably half a dozen boats docked, picking people up and shuttling them in and out." The disaster marks a critical moment for Walz, a first-term Democratic congressman from Mankato who has held office for only eight months. The seven counties now under a federal disaster declaration all fall within his congressional district. How government and its leaders respond to natural or made-made disasters can make or break a politician. Since the flooding, Walz has made virtually daily visits to the flood zone -- at least six visits in the first week alone. Along with the state's two senators, Walz lobbied for an expedited disaster declaration, so that federal dollars could start flowing to flood victims. When Rushford was in need of a fire truck because all its trucks were damaged by flooding, Walz's staff called around and arranged to have a tanker delivered from Esko, Minn.
At a recent town-hall-style meeting in Rushford, Walz talked to a group of dour-looking residents. At times, he was a cheerleader. He told them that things are "moving in the right direction" and "my biggest sense of optimism is the spirit of this community." He also repeatedly urged them to call his office for help in navigating the alphabet-soup of federal agencies. "Our role is to provide a face to a faceless bureaucracy," Walz said later. "My role is to be there. If these people are wanting to know how FEMA is going to work, there needs to be a (place) where they can come and ask that." Afterward, Joe O'Hara, a Rushford resident whose grandfather, Joseph P O'Hara, was a U.S. representative from Minnesota, walked up to Walz and complimented him on the job he was doing. "My grandpa would be proud of you. You've done great," O'Hara said. The floods of Aug. 18 and 19 were not Walz's first contact with flooding. As a member of the Army National Guard, he was on the ground in Grand Forks. N.D., in 1997 when that city was overwhelmed by water. He said FEMA's response to the disaster was "brilliant" and "incredibly organized." Of course, that was before FEMA sullied its name with its response to Hurricane Katrina two years ago. Walz said he remains "cautiously optimistic" that things are on track here. So far, Walz seems to have won high marks from local officials for his response to the flood disaster. "I've been through several floods down here. This is the first time I've had anybody in his position actually come to my city, not once but twice," Martell said. Winona County Commissioner Dwayne Voegeli said members from Walz's staff called twice in the immediate aftermath of the flooding to ask, "what do you need." "That response was unexpected, and it was wonderful, because we need help," Voegeli said. Walz said his biggest fear was how businesses would weather the storm. He worried that low-interest government loans, while helpful, just would saddle businesses with more debt. "In these small communities, the businesses are the ones that make everything go. They really do. I'm really nervous about the business side of this right now," he said. 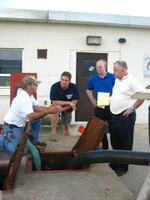 Photo: Local officials in Houston explain pumping operations to Rep. Walz.